We all have that one area of our makeup routine where we just want the best products, and nothing less will do. For me, it's the eyes -- I usually wear glasses 24/7 (I take them off for pictures), so making sure that my eyes stand out is important to me. here's my little army of reliable eye products that I love. Over the years, I have tried many, many different brands -- and I do have some "runner up"s on my list, which I'll turn to occasionally. But my one true love when it comes to eyeliner is definitely Kat Von D's Tattoo Liner in Trooper. There is just no competing with it. Picking a good "work horse" palette can be difficult, but mine would definitely have to the original LORAC Pro palette. With this one, I have been able to pull off a whole array of looks. Natural and subtle, smoky and dramatic, and even some fun combinations with garnets and purples. 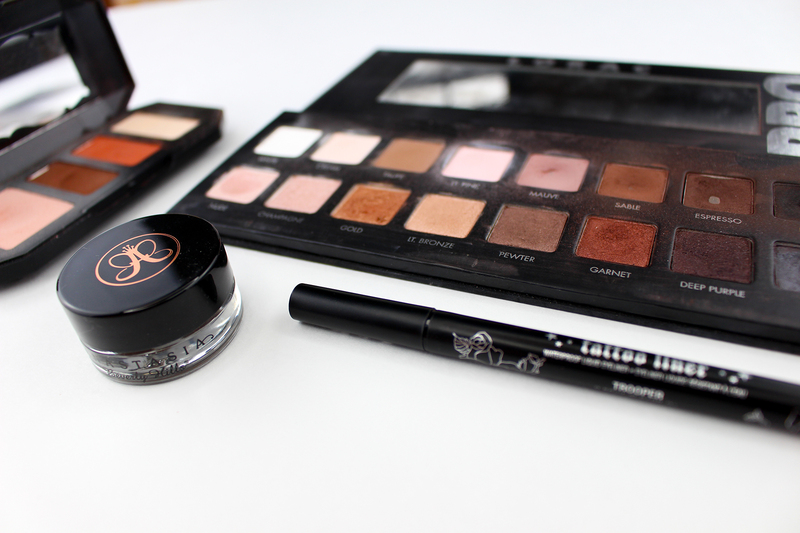 I often rely on this one when traveling, since this one palette can give me different looks for any occasion. And when space is a constraint (again, traveling), my second go-to is my Kat Von D quad in Rust. It obviously doesn't give me as many looks as the LORAC one, but this one makes doing my makeup very easy and quick. I just follow the suggested look that came with it, and I have a fail-proof go-to look. And these are my "holy grail" eye makeup products, the tried and true bunch that I know will never fail me. What are some of yours?